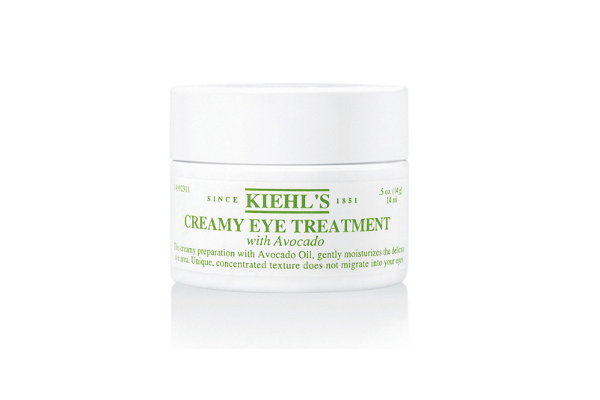 Kiehl's Creamy Eye Treatment with Avocado ($35-56) is a little pot of creamy green bliss. I picked it up out of my sample drawer when my favourite eye cream ran out a couple weeks ago, and have been using and loving it ever since. Avocado oil, shea butter, and beta-carotene give the formula its emollient and antioxidant-packed potency. I've already noticed an improvement in dark circles, puffiness, and fine lines. But the biggest—and most unique—selling point is its texture: slightly watery and tacky to the touch, the eye treatment sticks to skin upon contact and doesn't migrate into eyes or lashes. It's a godsend for contact lens wearers like me who dread the slightest bit of product in their eyes. Other tips: Pat the cream into your eye area gently (don't rub because the formula won't budge), and buy the smaller jar (once open, it only has a shelf life of 6 months). I don't typically use under eye cream just because I'm lazy. But the other day my boyfriend said, "Look I photoshopped out your under eye circles!" I think it's time I start using some cream ;) and I'm a big fan of Kiehl's. Haha! That's oddly sweet of your guy. The Kiehl's eye cream is very good. But the best one I've ever tried for brighter eyes is Philosophy Eye Hope. The first night I used it, the difference was so dramatic when I woke up that even the boy noticed ("Your eyes are so open").